Figure 18.15. Theoretical patient with persistence of low-level monoclonal IgG due to FcRn receptor recycling. 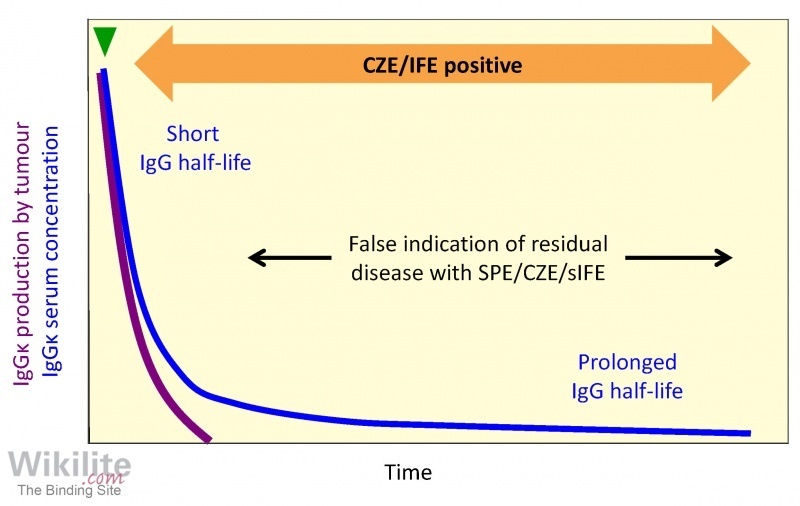 Although monoclonal IgGκ production by the tumour ceases following treatment, low levels of IgGκ are still detected by CZE/IFE due to prolonged IgG half-life. Ludwig et al. observed a normal HLC ratio in 12 of 35 MM patients who achieved a near complete response (nCR: 100% monoclonal protein reduction by electrophoresis, but IFE-positive), or a very good partial response (VGPR: at least 90% serum and urine monoclonal protein reduction) following treatment. 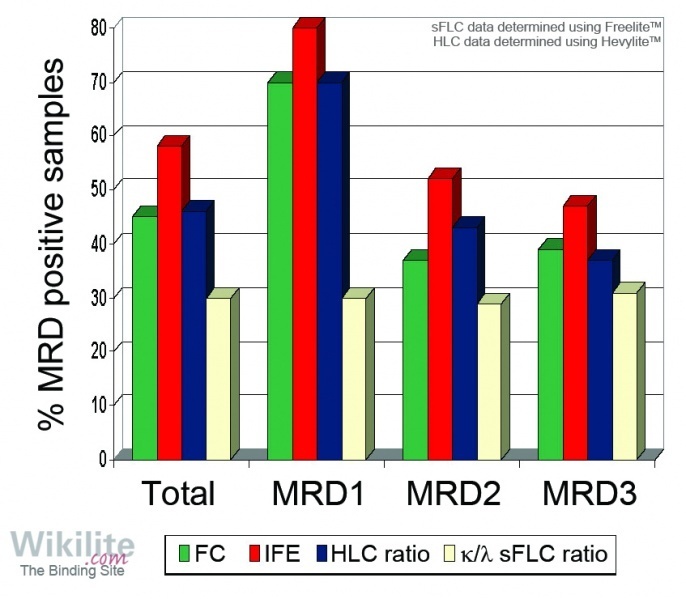 This discrepancy between HLC analysis and IFE may be due to the recovery of polyclonal immunoglobulins producing a normal HLC ratio, despite the persistence of small amounts of monoclonal immunoglobulin. While continuing low levels of a monoclonal protein may reflect residual disease, it has been shown that a normal HLC ratio predicts a good patient outcome, irrespective of IFE positivity (Chapter 20). In IgG patients specifically, persistence of small amounts of monoclonal IgG is partly the result of a prolonged half-life due to recycling by FcRn receptors, causing IFE to remain positive after the tumour has been eradicated. This is an issue previously reported by Waldmann et al. (Chapter 3) and demonstrated in Figure 18.15. Consistent with this, discrepancies between IFE and bone marrow immunophenotypic responses can be observed during follow-up . HLC ratios are not affected by the variable metabolism of IgG and for the detection of residual disease, they demonstrate a better agreement than sIFE with flow cytometry results (Figure 18.16) . Others have similarly found a good correlation between HLC and flow cytometry during serial monitoring  including those patients treated with novel agents .